A new house… literally, when the client got the blueprints, we jumped right in. It was 6,000-7,000sq. feet, and they wanted it “stylish,” with “flair,” oh, and also... “completely done black and white.” Her eye and our brand were a perfect fit. 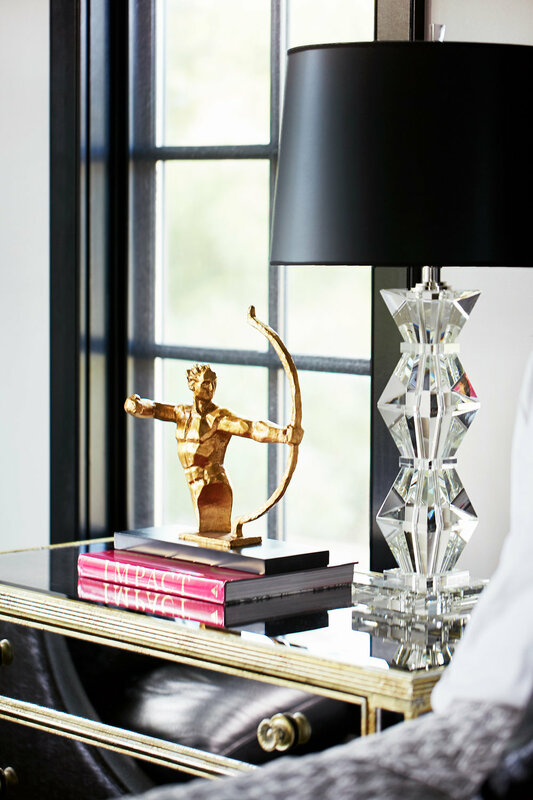 A Hollywood Glam home was the fun and fantastic result. Using multiple textures and finishes, adding layer upon beautiful layer, and bringing in highs and lows for dimensional support, we tackled the challenge of a mono-color palate. Of course we began in the kitchen, the heartbeat of the home. Here, mixing matte and gloss, high sheen with low luster, we designed a stunning black and white spectrum that takes us from glossy to matte. Shiny white tile on the floor moves to less sheen on the cabinets. An iridescent backsplash that catches our eye (and our breath!) and before directing our attention to the ceiling: black wood with a very matte finish. Injecting color in very specific areas throughout the house also let us inject “a little fun.” A visit to a London hotel had the client realizing she loved something we love, too: distinct objects. So we gathered them, adding not just interesting pieces, but also pieces that held great meaning to everyone in the family. Sitting in this home, you half expect Fred Astaire & Gingers Rogers to burst through the (custom designed) doors and dance across the glamorous black and white striped foyer. But while you’re waiting for them, you sink into the warm comfort of a home where every detail tells this family’s story, and invites you in. What is the most striking is their ability to really listen to their clients and reflecting those words and thoughts into the clients surroundings.